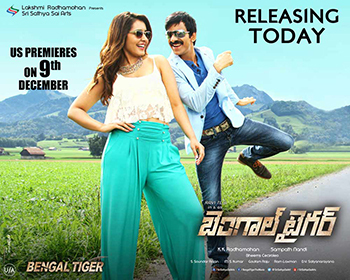 Bengal Tiger Review – To be in a good form is what every actor wish. They do anything to retain or regain their form. Ravi Teja is one such hero who is not in so good form. Right from his looks he changed for this movie “Bengal Tiger” directed by Sampath Nandi of Racha fame. He co-starred with Rashi Khanna and Thamanna Bhatia for this high voltage action entertainer produced by Radhamohan under Sri Sathya Movies. Sampath Nandi,who missed chance to direct Sardaar, is back with this Ravi Teja’s flick. Lets see how it works on us. Akash Narayan (Ravi Teja) is an easy going carefree guy who always enjoy his friends company lives in a remote village. His family tries to make him a responsible guy and fixes a match with Aksha. She tells him that she only wants to marry a popular person by which Akash (Ravi Teja) is hurt. So, he decides to becomes by doing anything and joins Shiyaji Shinde, a minister as his assistant. He later joins Nagappa (Rao Ramesh), home minister. Shradha (Rashi Khanna) falls for him and tells her father about that. Her father arranges marriage with Akash (Ravi Teja) and announces it before gathering on the eve of Shradha’s birthday. Akash rejects the marriage and announces that he is in love with Meera (Thamanna Bhatia), daughter of Chief Minister (Boman Irani). Who is Akash Narayan and what is his motive?? forms the rest of story. Story and screenplay of Bengal Tiger by Sampath Nandi is good. Dialogues are also good, but they seem to be forced at some places. Blending of commercial aspects and conflicts are too good. Conflict points and humorous scenes are good. Certainly Sampath Nandi is a good witer, but he focussed more on tried showing writer in him by forced dialogues. It should have been taken care of. Ravi Teja as Akash Narayan is apt and perfect. He pulled of his role with ease. He is looking good in this movie. Its his one man show. Rashi Khanna as Shraddha is good. Thamanna Bhatia as Meera is nice. Both the heroines performed well and looks gorgeous on screen. We know that Boman Irani is an excellent actor. He proves it again with this movie. Rao Ramesh is good. Thirty Years Prudhvi is excellent. He is an additional asset to the movie. Posani Murali, Shiyaji Shinde, Shankar and others are good in their movies. Music by Bheems is good. He is a good selection as music composer for this film. Chinna, who is famous for his background score gave nice background music for Bengal Tiger. Cinematography by Soundararajan is nice and stunning. Visuals are too good and colourful. Locations are shown well. Editing by Gowtham Raju is good. Fights by Ram-Laxman are good. Sets are good. Art direction is neat. Production values by Sri Sathya Movies is great. Overall Bengal Tiger Movie Review is First half good and humor and commercial aspects are blended in a good way. It ends in a very interesting way. Screenplay is good. Audience go clueless where the story is heading in first half. 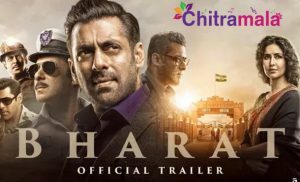 As the story starts revealing in second half it becomes a second half is a bit low on entertainment as compared to first half. Sampath Nandi who delivered a commercial hit with Ram Charan is back with Bengal Tiger. Ravi Teja’s waiting for a decent hit comes to an end. Totally, its a feast for commercial movie lovers and Ravi Teja fans. Go watch and have some fun.